Social Actualizers – we need YOU! It’s been over 15 months since John Lynch and I started work on developing out startup business, Climbing Fish. In that time, we have run a full pilot in Bath, UK – and spent a lot of time working out what our business is about. In recent times, our focus has been on who are our customers? What do they look like? What are their needs? We’re pleased to say, that we’ve come up with a precise definition of our target members. They are Social Actualizers (the ‘z’ is there – because our launch will be in New York, not the UK). So, “Who are Social Actualizers?”, I hear you ask. 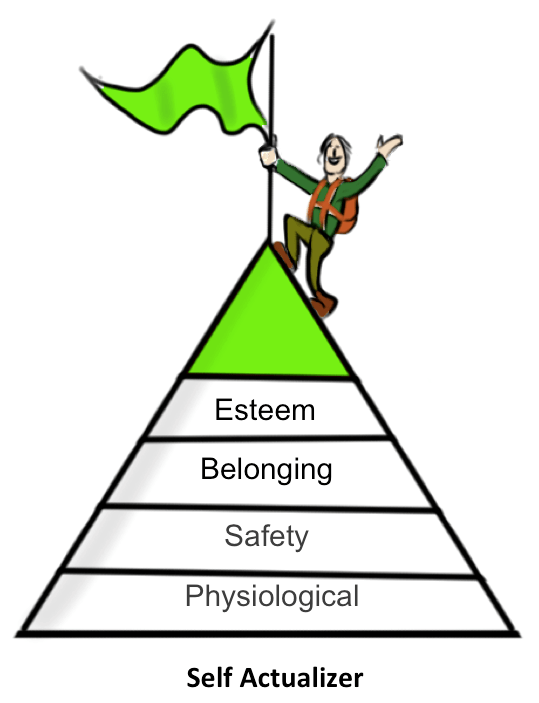 Well, if you have heard of Abraham Maslow and his Hierarchy of Needs – then you might have an inkling. Sixty years ago, Maslow noted that the basic needs of humans must be met (e.g. food, shelter, warmth, security, sense of belongingness etc.) before a person can achieve self-actualization — the need to be good, to be fully alive and to find meaning in life. Research shows that when people live their lives that are different from their true nature and capabilities, they are less likely to be happy than those whose goals and lives match. For example, someone who has inherent potential to be a great artist or teacher may never realize his/her talents if their energy is focused on attaining the basic needs of humans. Fast forward to today, and we think you are starting to see a different sort of person. People who care more about the world than themselves, who want to make social change. Who want to bring people along with them to make change. This is who we are calling Social Actualizers. They are at the top of the pyramid – but want to give others a hand up. Would love to say that the term Social Actualization was first used by us – but that honour goes to Chip Conley in a Huffington Post article at the end of last year. We’re looking for these folk in New York for our May launch. Are you one? Please email me at phil@climbingfish.com – would love to chat with you to help refine our service before we launch. I’m just coming to the end of my 2 month stay in New York City. 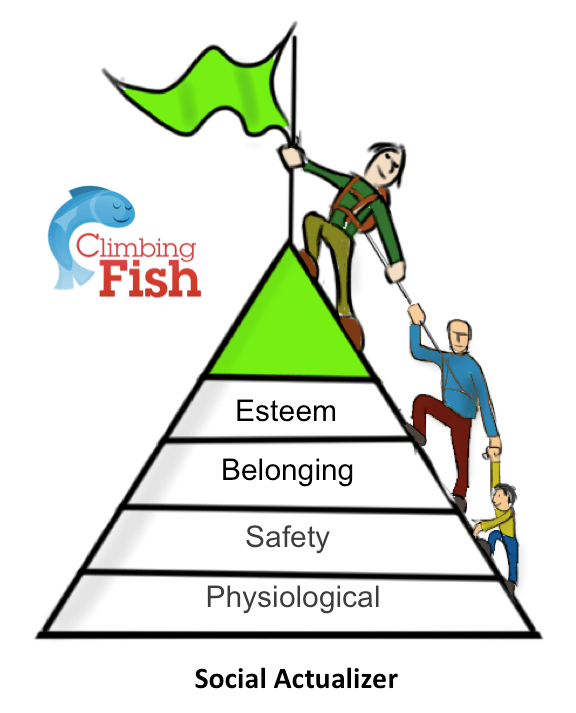 It’s been a great place to explore the theory behind my startup business, Climbing Fish. I’m even more convinced that it’s quality connections and conversations that help people to do great things (and for some reason we have stopped doing both). We’re now planning a spring launch of the service in the Big Apple. As I pack my bag, I’ve added to the weight by a few books collected. Prized is Seth Godin’s book (personally signed) “The Icarus Deception” – still not fully read! Others have been read – and others consumed via my friend’s excellent startup audio book service, Bardowl. This morning I had a long conversation with my Climbing Fish co-founder about the value of reading self-books. We are both cynical about how much benefit they give – especially compared to conversations – but we both, like flies to the light, get drawn in! Also, we discussed whether we give academic, well researched, structured writing too much time – and whether it freezes us into inaction. Discuss? 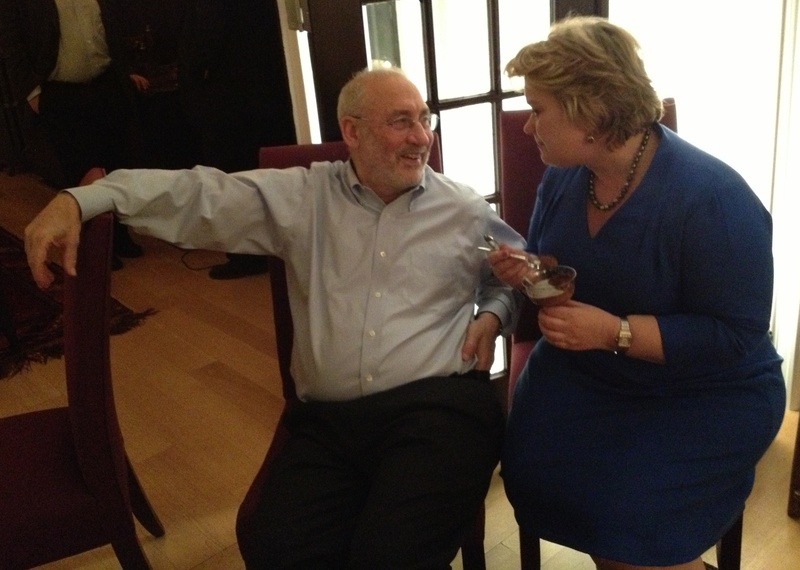 On my last night in Manhattan, I had a very swanky invitation to the Upper West Side to the home of Nobel Laureate Joseph Stiglitz. Not my usual circle. My friend – Mrs Moneypenny (the Financial Times columnist) – was speaking to a group called “Sunday at Six”. The soiree is run by another Brit – Phyllis Roome – and is an invite only event dedicated to getting people together in real conversations (very Climbing Fish!). Mrs M gave a great performance – in between drinks and a very nice supper. She was launching the paperback version of her book “Career Advice for Ambitious Women” (which is just out in the US). She’s not just a columnist – but makes her living as a headhunter … mixed with stand up performances in Edinburgh Fringe and off-Broadway. Very entertaining – and as you can see from the picture Joseph was very relaxed with her conversation. I’d done my usual Google research on Joe. His resume is incredible. He is a Nobel laureate in economics, a professor at Columbia and a former chairman of the Council of Economic Advisers and chief economist for the World Bank, is the author of “The Price of Inequality.”. In the last week, he’d written an excellent piece for the New York Times – “Inequality Is Holding Back the Recovery” – that gave an overview of how he felt the US would only get economic recovery through dealing with inequality. In the article, he advised President Obama to focus on clearing up inequality – especially the shocking child poverty in the country. 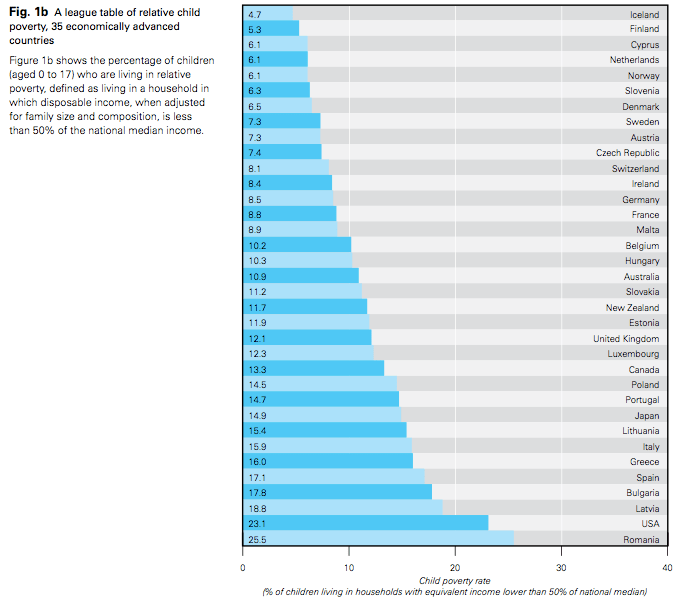 I looked at some of the UN stats in this area – and the US record on child poverty is horrific. Joe’s article had over 700 comments. His argument was very strong. He was right, but what could I do? I was a bit disappointed – he might have seen it in my face. No time to discuss further. What had I expected? Maybe a “tie a yellow ribbon” moment – something that millions of people could do as individuals today (without reading more books, articles, political lobbying – or waiting for someone else). It convinced me that we’re on the right track with individual action to solve solutions – by maybe less reading and more conversation…. leading to REAL action. I am spending my time in New York trying to test “off-line” whether the principles behind our startup business, Climbing Fish, hold water. The key elements are seeing whether people “get” the concept, where the target audience hang out, whether there is an over saturation of connections in this age of social media – and whether getting back to good old conversations is as important as we think. as we begin 2013, I can’t help feeling that the proliferation of new communication channels and “smart” devices has only further fragmented and strained the flow of real conversations. It has obscured content that is worth consuming. As multi-tasking has morphed into multi-casting — that is, it is now often less about trying to do more at the same time than trying to tell more at the same time — it has all increasingly gotten in the way of what we are trying to optimize, which is connectivity. In fact, it is quite clear that in many instances it has diluted the quality and relevance of our conversations. I love this piece! As someone whose formative years have been greatly influenced by advancements in technology (born in ’85! ), I sometimes find myself balking when it’s time for meaningful face-to-face conversation, despite knowing full well that it is important and effective. It’s not that I don’t want to speak with my friends, colleagues, clients, etc. while looking them in the eye – frankly, even phone is difficult for me sometimes – but it’s that my generation has been conditioned otherwise. It’s so easy for me to socialize face-to-face when it’s all fluff and fun, but when it’s time to have a serious conversation – whether it’s personal or work-related – nerves kick in. Perhaps because it’s too real-time, too unpredictable, too uncontrolled. Sarah (V stands for Vaynerman) was – as she said in the comment – very good on Twitter and email. She agreed to meet at my co-working space at NYC Alley. What would the conversation be like….? When she was in 6th grade in the mid-90s, her mum (who was quite techy) showed her the Netscape Navigator browser. Sarah got hooked on surfing the internet. As time moved on a little, AOL suddenly became the think to join up to and her teenage years were spent communicating with her friends on AOL Instant Messenger. In late teens, the cellphone arrived – and texting each other was the thing. Now, Sarah says that she feels very comfortable with technology – and is used to the ability to use short form written communication to consider and compose a response to in her own time (usually very quickly). She feels in control in this way. Sarah is concerned on the subject – especially how our brains become re-wired with technology. She pointed me to a New York Times article in 2010 – Attached to Technology and Paying the Price – that talks about technology giving you a “dopamine squirt”. Can a “Slow Conversation” compete with that? She’d seemed to have been listening in to John and my conversations…. We’ve agreed to keep our conversation going. It’s always interesting when you feel stars align. I headed off for a bowl of soup at the local coffee shop (The Cafe Grind on 10th Avenue – thoroughly recommended). As I came out – I noticed their A-board. Einstein again … maybe he’s trying to send us a message about Climbing Fish! During our conversations about Climbing Fish (the start up I am working on with John Lynch) – a friend used the phrase “mild rage”. Somehow it’s stuck – and become a term we use when we describe how people feel when they are not using their genius. (I) When you’re not living faithfully to your Genius, you find yourself feeling incomplete. (II) You may have found that it’s easier to fill the roles your family and friends expect of you, rather than becoming who you really want to be. (III) Living this way drains you of the energy you need to pursue the things you truly value, what remains is mild rage. It’s been a contentious phrase – some on our mini-board feel it has a negative sentiment that should not be used in our marketing. However, John and I have stuck with it. In fact, we’ve been floating it around a little more (especially during our time in New York) and we’ve had some really positive feedback. so many people struggle in what you call “mild rage”. I totally understand that! Tonight is John’s last night in New York – so we went and had a few beers and supper. We then stumbled upon the National Comedy Theater. It’s described as New York’s home for improv comedy. It certainly was that – lots of improv in the style of “Whose Line is it Anyway”. Lots of audience participation – and I couldn’t resist when the crowd was asked for an emotion to be acted out on stage shouting out “Mild Rage”. Conversations, Connections, Stories & A Fable for Animals…. I love the power of connection. Opening up to people and engaging in conversation just seems to spring connections and opportunities. Last week, I went to a Meetup with the folks from Conversations New York. Two of the members were kind enough to invite me (and my co-founder of Climbing Fish, John Lynch) along to a couple of events in the city. Michele Fulves invited us uptown to an early evening session of the Red Harlem Readers. The event is in the Indian Cafe, just below Harlem on the West side. It’s a lovely venue – enhanced by a glass box onto a New York street. There’s lots of interaction with passers by – and the taxi cabs race past. Stella Pulo did a reading from her book “Shrimp Shells in My Cleavage – Travel Tales from an Aussie Actress on the Run.” It was an engaging event – I like colourful storytellers .. and Stella is certainly that. Last night, Elizabeth Cohn (also from the CNY Meetup) invited us over to Brooklyn to The Moth SLAM event. When we arrive there were queues up the block. Luckily Liz was on the VIP list with some pre-booked tickets – so we managed to dodge all the queues. The Moth concept is very popular – and a big hit on National Public Radio (NPR). People put themselves forward to be picked to get on stage and tell a tale. They each have 5 minutes to tell a real life story. Compere Peter Aguero was great fun – although he did pick on me a few times as I was on the front row snapping with my camera (quietly, no flash … but still he picked on me!). The Bell House is a great venue. My favourite story of the night (but sadly not the winner) was by Adam Fawer. Adam explained that he had gradually gone blind when he was young (still retains some vision). Writing had been a release for him – and although he followed a “normal” career, he’d at one point taken a break to pursue his love of writing. His book was taken up by a major publisher, got great reviews – and combined his love of thrillers and maths by being based on the probabilty theory (book title “Improbable”). Sadly, book sales did not mirror the great reviews – although it did get translated and published in 18 countries. He created a second book – but it was only taken up in a Turkey, Germany and Japan (where sales had been reasonable). Adam had to go back to work in the real world…. He did start getting pestered by the Turkish book publisher to visit Turkey. He ignored this – as he needed to focus back on his career. The guy kept on pestering. Finally, Adam got a call from the US State Department saying that he should go to Turkey to help with their promotion of the USA. He looked up how his books performed in Turkey – and the two books were both in the Top Ten Best Sellers – ahead of the likes of JK Rowling and Stephen King!. He did the tour – and I’ve since seen the Youtube video to prove his popularity (there was a bigger queue than the whole of the audience at last night’s gig!). As I now have a reputation for having pictures taken with famous authors (Seth Godin last week – Adam Fawer this week) – I got a snap with him at the bar after the event. He’s definitely a Climbing Fish candidate. Finally – a big thank you to Liz for this invite. Inspiring Event… Liz has become a big fan of Climbing Fish – and shared with me a short story she has framed on her wall at home. It’s very Climbing Fish…. Once upon a time the animals had a school. The curriculum consisted of running, climbing, flying and swimming, and all the animals took all the subjects. The duck was good in swimming, better in fact than his instructor, and he made passing grades in flying, but he was practically hopeless in running. Because he was so low in this subject he was made to stay in after school and drop his swimming class in order to practice running. He kept this up until he was only average in swimming. But average is acceptable, so nobody worried except the duck. The rabbit started out at the top of the class in running, but he had a nervous breakdown and had to drop out of school on account of so much makeup work in swimming. The squirrel lead the climbing class, but his flying teacher made him start his flying lesson from the ground up instead from the top of the tree down. He developed charley horses from over-exertion at the takeoff and began getting C’s in climbing and D’s in running. The practical prairie dogs apprenticed their offspring to a badger when the school authorities refused to add digging to the curriculum. At the end of the year, an abnormal eel that could swim fairly well, climb and fly a little was made valedictorian. P.S. On the Subway ride home from Brooklyn at 1am in the morning, couldn’t resist snapping these young people who had met on the train. The couple on the left were engaging in deep conversation with the young Swiss guy on the right. Conversation New York is alive everywhere in the city…. I’m enjoying using Meetup while in New York. There’s a constant flow of opportunities to find interesting people at events large and small in Manhattan. The alerts come through regularly during the day – and I am always surprised at the wide range of interests. I suppose that’s the beauty of living in a big city. At the end of the week I was alerted to a group called “Conversations New York” via Meetup. While I’ve been in New York I’ve been researching what part conversations play in greasing the wheels of my start up business,Climbing Fish. I’ve been reading a book called “World Cafe – Shaping our Futures through Conversations that Matter”. The process outlined in the book is tried and tested on groups – and is an inspired way of getting conversations going. I’m working out how to apply this to the one-to-one connections that Climbing Fish intends to make. We’ve drafted in the thinking of the test group from Bath that tried out the Climbing Fish pilot this autumn – all who did our survey have been given a copy of the book. At that small table were people dedicated to Socratic Learning, getting fellowship for seniors in the population through conversation, diversifying the conversations of blind people from just always talking about fund raising, simply getting people to “Talk to me”, encouraging the immigrant population of the Upper West Side to start conversations again in the Hungarian Pastry Shops and generally stop technology separating us. I’m hoping that in my time in New York to help the group with its aims. They are already excellent catalysts for the conversations of New York. On their site – there is a calendar of monthly events, and they track the activities of over 50 groups creating conversations in New York. If you are in New York – please take a look at the calendar and join the conversation! As I said in my last post “I’d like to help you explore through conversations with strangers your undiscovered genius, maybe add fire to your “mild rage” or give you a whole new perspective. I believe this could change you, the people you meet and maybe the world for better – and help us all rediscover our art!” These guys are doing a great job at this. I’m in New York for a couple of months, working on a combination of business and personal projects. I’m loving the experience….. The year started with a chance to see one of my favourite authors, Seth Godin, speak about his new book “The Icarus Deception”. The Video below gives you a nice flavour of what the books (and the overall project) is about. At Seth’s talk at the Haft Auditorium in Manhattan, his focus was on how people needed to find their art. It’s a continued theme in Seth’s writing to not conform, not be a cog in the machine, be unique, be a linchpin. He talked passionately about the “Power of Connection”. That the “More we connect – the “richer” we get!”. This resonates so much with the work I am doing with Climbing Fish – my new venture with John Lynch. Seth also talked about the new “Connection Economy” and how it is created by the generosity of individuals mixed with their art. In the evening, I attended one of Seth’s Icarus session in New York via Meetup. The room at NYC Alley (by coincidence my new co-working space for the next month) was filled with Seth Fans who did an individual pitch of their “art” for 140 Seconds. Mine is below…. Thanks Seth for making me stand up and share my art…. Good evening – My name is Phil O’Brien. As you can tell from my accent, I am an Englishman living in New York for a while. My art is connecting people. I like to help connect the dots of people’s lives. It gives me energy – it’s my passion. I love listening to people, strangers. Trying to find something of their essence – and then connecting them to someone I know, or another stranger that I meet, a person who has a fresh perspective that will help each of them to grow. I’m trying to develop and refine my “off-line” connecting art – and see if there is any way to take what I’ve learnt to accelerate connections on-line. I believe that conversations with strangers help people discover new paths, rewire their thinking, help their quest to rediscover genius. Sadly we’ve lost the appetite for serendipitous conversations in this time managed, too many meetings, over connected world. I’d love to chat with any of you strangers/you geniuses – let me buy you a coffee or a beer. I want to help you cast off your LinkedIn “game face”, your CV, your resume. Leave behind for a little while your Family/Facebook/Friends who often don’t want you to rock your boat – or indeed theirs. I’d like to help you explore through conversations with strangers your undiscovered genius, maybe add fire to your “mild rage” or give you a whole new perspective. I believe this could change you, the people you meet and maybe the world for better – and help us all rediscover our art! Let me see if I can help connect some dots for you. I’d appreciate you helping me to become a better connector – and to practice my art.